The German Shorthaired Pointerpoodle is a mixture of the agile German Shorthaired Pointer and the clever Poodle. A keen hunter and fun companion, he is the perfect dog for those looking for an active canine partner. He is a dog who likes to use his brain. He can give you a wonderful introduction to the world of dog agility and competition. He is good with children and friendly to animals and humans alike. He’s a pleasure to own and is a great dog to help keep one in shape. The German Shorthaired Pointerpoodle is very intelligent and active. What Price are German Shorthaired Pointerpoodle Puppies? The price of German Shorthaired Pointerpoodle puppies is anywhere between $550 to $1,250. 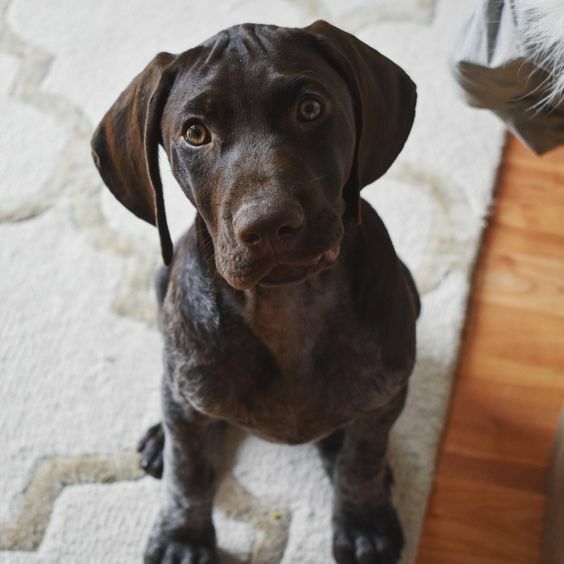 How to Find Reputable German Shorthaired Pointerpoodle Breeders? You’ve finally decided to get a German Shorthaired Pointerpoodle puppy, and you’ve decided to go with a breeder and not a rescue or shelter. You have also conducted your own research online and narrowed your list to just a few breeders. But how do you tell reputable breeders from the bad ones? The rule is to never buy a puppy without meeting it in person. Always insist on seeing the mother of the puppies and check where the dogs are being kept. They should live in a clean and indoor environment. They should also be well socialized, including the parents of the puppies. Be sure to research your breeder ahead of time. Ask for veterinarian references and references from other customers who have bought puppies from them. Reputable breeders treat their breeding dogs as house pets. They should be exposed to different people and situations to be well-socialized. They should be introduced to children, visitors, and household noises. Beware of a breeder who does not allow visitors ever. For health reasons, many breeders hold only occasional open houses or only allow visitors once the puppies are at least six weeks old. However, it’s a red flag if a breeder will not allow any visitors at all. Health testing should be done on the parent dogs, and you should be able to see a record of that. Don’t be afraid to ask as many questions as you need to. After all, a puppy is a long-term commitment. The decision to find one through a breeder should be carefully thought out. Reputable breeders do not sell their puppies to pet stores. If you are just beginning your search for a puppy, the national breed club or local breed club website is a good resource. It often includes general information on the breed, as well as a list of breeders and other relevant breed organizations. The German Shorthaired Pointer parent was developed by crossing foxhounds, tracking hounds, and pointers. It was to create a breed that has an incredible power of scent and endurance. It’s very agile and fast. It was well-appreciated in the field, though lost favor during World War II. The Poodle parent excel as a hunter of waterfowl. He also worked as a circus entertainer. It was once the most popular breed in America. The German Shorthaired Pointerpoodle is affectionate and easy to train. A slender yet athletic dog, the German Shorthaired Pointerpoodle is a medium size dog with long legs and a long body. His coat may have different colors, including cream, apricot, brown, silver, black, gray, blue, red, white, and liver. His ears will hang low and may have a soft fur covering. His coat could be wavy or have a slight curl. It may also grow at varying lengths over the body. His eyes are bright and round and show intelligence and confidence. His stance is symmetrical, and his tail is held straight or up. The German Shorthaired Pointerpoodle may need a fair amount of grooming and maintenance, depending on the coat texture that he has. If he has inherited Poodle characteristics, he will need professional grooming at least once every two months. But if you choose, you can keep his coat clipped to space grooming appointments further out. This dog may need to be trimmed, brushed, and bathed every month or two. But brushing will be needed every day. It is also important to check his feet if he has been on a hunt to ensure they are in tiptop shape. His nails should be trimmed every few weeks, unless he wears them down on his own. His ears must also be checked regularly for odor or redness. His teeth must brushed a few times a week. How Big is a Full-Grown German Shorthaired Pointerpoodle? Male German Shorthaired Pointerpoodles grow to 20 to 23 inches and weigh 45 to 65 lbs. Females grow to approximately 20 inches and weigh 45 to 55 lbs. What is the Life Expectancy of the German Shorthaired Pointerpoodle? The life expectancy of German Shorthaired Pointerpoodles is 10 to 14 years. The German Shorthaired Pointerpoodle is a perfect dog for those looking for an active canine partner. These dogs are very affectionate, cheerful, lively, and energetic. They are loyal and loving, and they are quite responsive. They have an aggressive streak, but they are highly alert when they need to be. 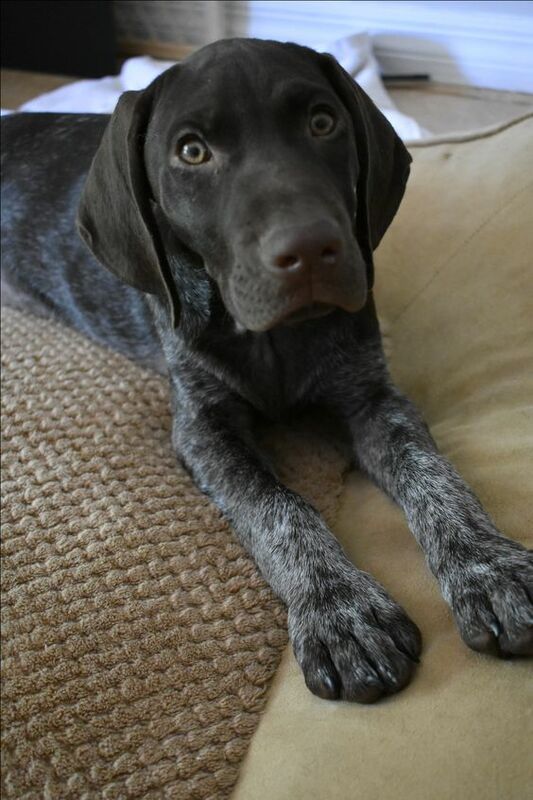 German Shorthaired Pointerpoodles are great with kids because they are playful and energetic. 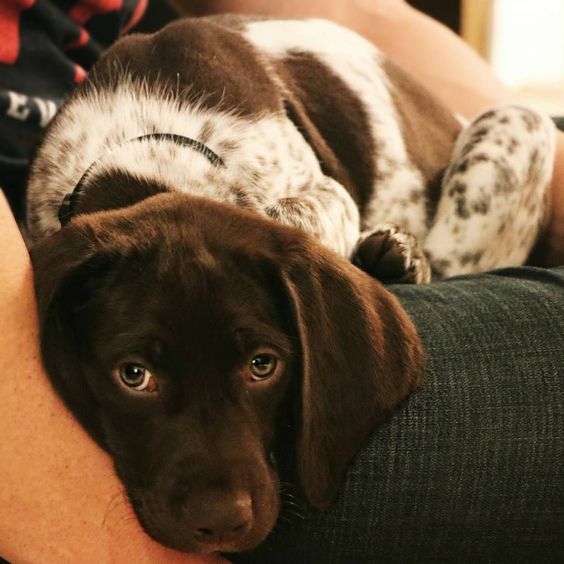 These dogs are intelligent, quiet, and may have a high hunting drive, thanks to their German Shorthaired Pointer parent. They also have a high tendency to roam and wander. Typically, these dogs are extremely clever and have an excellent memory. Not only do they pick up on commands easily, they can also be hard to break of unwanted habits. The best way to avoid unwanted behaviors such as chewing, barking, or destruction of property is to keep their mind and body stimulated. Enroll them in obedience classes or engage them in activities such as agility, running, or visits to the dog park where they can interact with other dogs. They are affectionate with family but may take some time to warm up to strangers. From birth to 14 months, feed your German Shorthaired Pointerpoodle top-grade commercial puppy formula to ensure proper growth. High-quality dog foods have the right amount of ingredients that provide optimal amounts of vitamins, phosphorous, calcium, protein, and calories. The first year of your puppy’s life sets the stage for its health and happiness in later years. Overall, giving your puppy supplements is not required if you’re feeding your puppy high-quality food. Follow the package directions to determine the daily ration, and feed half of it in the morning and half in the evening. Allow your puppy to eat all it wishes for 20 minutes, and then remove the food from its reach until the next meal. Your puppy will quickly learn the good habit of eating on a schedule. Refrain from feeding it table scraps and treats between meals to avoid upsetting the nutritional balance. Refill their drinking water daily and wash their bowls at least once a week. To help ensure the best life possible for your dog, be zealous about keeping its weight at a healthy level, but don’t underfeed it, either. Reserve treats for training sessions. Some German Shorthaired Pointerpoodles like eating avocados. You can give them these occasionally in bite-sized pieces between meals. The breed generally doesn’t need dietary variety to satisfy its cravings. They can become finicky eaters and learn to crave treats if they’re frequently given things other than their regular diet. How Much Exercise Does a German Shorthaired Pointerpoodle Need? The German Shorthaired Pointerpoodle is a very energetic dog. He will do well with over 60 minutes of activity each day. He will be in excellent shape if you do this for him, and you will be, too. He is fast and athletic and can make an excellent hiking or running partner. He also loves swimming, so trips to the beach or the lake will be thoroughly enjoyed. He is a bit too active for apartment living, though. A fenced backyard is best so that he does not seek freedom and chase the neighborhood wildlife. He is suited to all climates. But if you do get his coat clipped or trimmed, make sure to provide adequate warmth during really cold weather. Major health concerns that affect this breed include overactive tear glands, bloat, and hip dysplasia. The veterinarian may require your dog to undergo occasional tests including lab tests, blood work, physical examinations, CT scans, and x-rays. German Shorthaired Pointerpoodles are very intelligent, active, affectionate, and easy to train. They are good with children and make very good family dogs if you have room for them and can provide plenty of daily exercise. They do have lots of energy and love to run, so exercise is important. Like most sporting dogs, they also love to be with their families and will not do well if they are not a part of family activities.